- The triumphant red dragon stands his ground amidst a ring of standing stones carved with runes and spirals. Overhead, an icy white dragon spirals, just waiting for his chance at revenge. 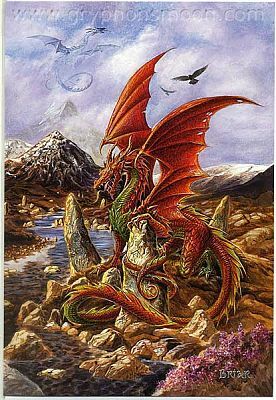 Card measures 8" by 5 1/2"
Do you have any other questions about our Fire Dragon Greeting Card? Very nice artwork, very well printed. I bought it for a Dragons fan and sure she will love it ! Beautiful card with lots of details. I have ordered several to place on my altar. Some for the Goddess and some for the God, instead of statues. Is much cheaper for a small purse. I have ordered different ones for the different seasons. Works wel.